At SMCPS we believe that the development of language and literacy skills are of the highest priority. We address language special needs throughout the school with the help and input of the SENCO, Speech and language trained staff and through using school-based resources and those of the outside agencies. We plan termly with colleagues within Early Years and Key Stage 1, Y3 and Y4 to ensure continuity and progression. Once the children have internalised the text, they are then ready to start innovating on the pattern of the text. This could begin with more advanced activities to warm up the key words and phrases of the type of text focused on so the children can magpie ideas. Younger children and less confident writers alter their text maps and orally rehearse what they want to say, creating their own version. 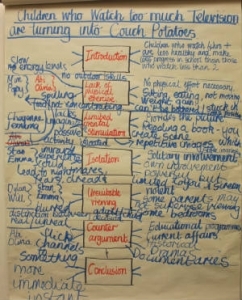 The key activity in this stage is shared writing, helping the children to write their own by “doing one together” first. This could begin with using a boxed-up grid (innovating on the exemplar plan) to show how to plan the text and then turning the plan into writing. This allows the children to see how you can innovate on the exemplar text and select words and phrases that really work.Demonstrating how to regularly read your work aloud to see if it works is important here. This process enables the children to write their own versions through developing their ability to generate good words and phrases and also, hopefully, develops the inner judge when they start to decide why one word or phrase is best. If, during this process a teaching assistant (or in KS2 an able child) flip-charts up words and phrases suggested, these can be put on the washing line alongside the shared writing so when the children come to write they have models and words and phrases to support them. Throughout the shared writing, the children should be strengthening the toolkit so they start to understand the type of ingredients that may help. Once they have finished their own paragraph/s children should be encouraged to swap their work with a response partner. 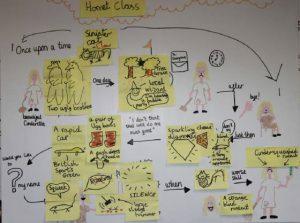 Then with the aid of a visualiser, the whole class can also discuss some of the more successful work. Time now needs to be found to enable the children to give their own work a polish in the light of these discussions and perhaps to begin the dialogue about what works by writing their own comment on their work for the teacher to comment on. At SMCPS we follow the Letters and Sounds phonics program. This program has clear progression through the skills and understanding as well as tricky words, this is linked to each year group and compliments the progression stated in the National Curriculum. From Early Years to Year 2, there are daily phonics lessons and as the children move to KS2 the phonics lessons graduate to spelling patterns and the children have three lessons a week. All phonics lessons will follow the structure: introduction (Objectives and Success Criteria), revisit and review, teach, practise, apply and assess. At SMCPS, we believe that a combination of discrete phonics teaching and reinforcement across the curriculum will provide the children with a balanced diet to help them continually progress with their phonics both in reading and writing. Teachers plan and develop phonics learning sequences to ensure they are cohesive with the development of reading skills. Within the planning for reading, writing and phonics, high frequency and tricky words are included when appropriate and continue to be developed and progressed in to KS2. This is also the same for punctuation and grammar, the planning is well developed so the links between all elements are meaningful and appropriate for the children. - Consistent use of vocabulary, including phoneme, grapheme, digraph sounding out, blending and segmenting. - Well organised enjoyable lessons with appropriate resources – make it fun! - Discussions – children talking about the sounds/words and linking to previous learning/what they already know. - Links - being made continually throughout the lessons at all levels and to prior learning in class and prior knowledge of the pupils. - Give pupils time to reflect and discuss their own learning from that session; What did you learn today? It is vital that all phonics teaching is reinforced in other lessons so the children become confident when applying their knowledge in other contexts.